The exhibition ’60 Years of APA, the Association of Polish Artists in Great Britain’ showcases the art of its present members. APA holds two or three exhibitions a year in the POSK Gallery, which was originally incorporated in the design of POSK - the Polish Social and Cultural Association building as a gallery for Polish artists, but which now holds exhibitions of art from Britain and many other countries. 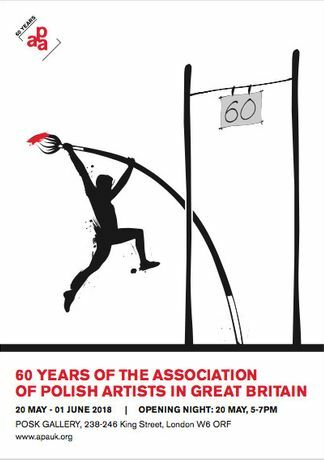 Polish artists, some of whom later founded the APA, the Association of Polish Artists in Britain have been in Britain since before the Second World War. The name of Feliks Topolski is familiar to those who pass under the arches of Waterloo Bridge on the South Bank. His former studio, now a café-restaurant, ‘Topolski’, still displays his art on its walls. Topolski studied at the Warsaw Academy of Art, then in France and Italy, arriving in London in 1935. He later became an official ‘war artist’. In 1989, he was elected a senior Royal Academician. The work of some of those artists still hangs in the corridors of POSK. The graphic paintings of Marek Żuławski, the exuberant forms in motion in the paintings of Stanisław Frenkiel and the large-scale oil canvases of Janina Baranowska can be seen by those visiting the cultural centre. Janina Baranowska was a pupil of David Bomberg, and one of the founding members of APA. She was also at Bohusz-Szyszko’s School of Easel-Painting. Marian Bohusz-Szyszko’s art still hangs on the walls of St. Christopher’s Hospice in London, founded by his wife, Dame Cecily Saunders. The latest large event was a selective exhibition, organised by the Ben Uri Gallery and Museum, entitled ‘Art of the Bloodlands - a century of Polish Artists in Britain’. The curator, Rachel Dixon, showcased art from their permanent collection, such as that of Josef Herman and Jankiel Adler, adding works from the POSK permanent collection, for example, by Marian Bohusz-Szyszko and Janina Baranowska, as well as those by younger artists, many of whom now comprise the APA.